American tourism is big business. In one month international visitors to the United States can spend more than $15.4 billion. And that's expected to rise. The National Travel and Tourism Strategy, launched in 2012, was created to draw 100 million international visitors to the U.S. by 2021 with hopes of having them spend $250 billion annually. And that's just international visitors. Your fellow Americans are also traveling to U.S. tourist sites and opening wide their wallets. Law enforcement officers who work in tourism towns have a two-fold mission, protecting the locals and protecting the droves of tourists that the locals depend upon for their livelihood and their departments depend upon for operating funds. That may sound crass but law enforcement agencies in destination areas have to be aware of the numbers and what they mean. Destination areas have two populations: the year-round locals and the visitors. A small beach town of 50,000 can swell to 10 times that size during the summer. The agency serving that town has to have resources and personnel well beyond what it could afford if its budget were based on the local tax base. So tourism dollars are the life's blood for such an agency. To keep the tourism dollars flowing, destination area officers must ensure that both the visitors and the locals are safe and secure, all while maintaining the fun and friendly atmosphere that attracts people to the area. Officers in tourism areas have to be adept at crime prevention, crime response, and crime fighting, all while keeping smiles on their faces. The following is a look at what it's like to work some of the nation's busiest playgrounds. 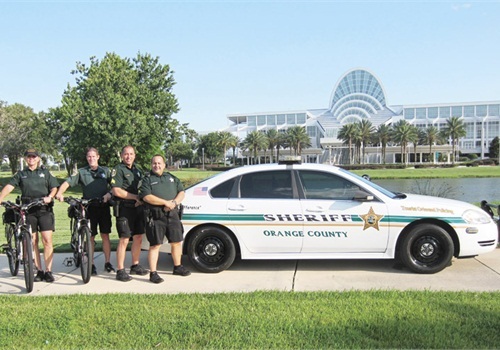 The Orange County (Fla.) Sheriff's Office has one of the nation's most enviable and challenging tourism jurisdictions, including Walt Disney World, Universal Studios, and all of the other theme parks and tourist attractions just outside of Orlando. Capt. Gil McDaniel says he and the other officers of the Orange County SO must always be aware that their job is to protect and serve not only the locals, but the area's 56 million visitors per year, including presidential candidates, foreign dignitaries, and celebrities. Working the International Drive corridor (I-Drive in local parlance), which is lined with theme parks, hotels, restaurants, and one of the nation's largest convention centers, McDaniel oversees 76 deputies who are supported by tactical and mounted patrol units and traffic and motorcycle squads. "Overall this is one of the safest places on Earth. Our crimes are crimes of opportunities. The biggest thorn in my side is car burglaries," he says. McDaniel believes that people have a tendency to forget basic street smarts when they arrive in Orlando. "On vacation, you're here to unwind and have fun, you're drinking in all the beauty and the cool stuff you see, and so you might not be on your guard so much," he says. "You might be shopping at Coach and then stick your bags in your car seat where anyone walking by can see, and not lock your door." Hotel burglaries tend to be another crime of opportunity against unwary tourists. McDaniel says tourists sometimes prop open their hotel room doors because one of their kids has the room key down at the pool. Other tourists might leave say a computer tablet in the business center when they use the restroom, and when they return, it's gone, along with a wealth of personal information. The theft of personal information and identity fraud is a growing problem in America's tourist areas, and McDaniel says these scammers like to hit travelers when they are most vulnerable. He explains how "pizza flyer guys" will slip a flyer under a tourist's door offering great prices for credit card purchase and then, after a long day of sightseeing, that tourist will come back to the room and order the $12.99 large pepperoni. The scammers now have the tourist's credit card number, and the tourist never even gets a pizza. Orange County SO has forged a community-driven strategy to combat crimes against tourists. As part of this strategy, officers are encouraged to take the time to have friendly chats with residents, tourists, business owners, and security from the theme parks like Sea World. "We are grippin' and greetin,' meeting people," McDaniel says. He explains that Orange County SO deputies might take a picture with a kid or talk with hotel security, but they're working—even if it just looks like they're chatting. Through all this grippin' and greetin' Orange County SO deputies are actually building relationships and pushing the Sheriff's message of "if you see something, say something," according to McDaniel. But community policing and tips are just one part of Orange County SO's crime prevention effort. Another major element of the agency's strategy is identifying hot spots using Compstat. "Every morning on my phone, I get stats on my district…and direct resources to it. It's like insider trading. Now we're getting [stats] in real time, so we're always on it," McDaniel says. He explains that the agency uses Compstat to map patterns and uses this data to "find, fix, and arrest" the perpetrators. Enforcing the law in a tourist area requires a different way of policing, McDaniel confirms. "With all these heads and beds, we need all of these hotel rooms to be full and these people eating in restaurants because the tourist core is our economic core." How does that translate to policing? "If I stop a resident in traffic…they know the laws and should know better, so they'll probably get a ticket. But if one of our officers sees someone who is driving strangely and stops that person and finds he is from Europe in a rental car, having trouble driving on the right side of the road or lost, that officer is likely to be more sympathetic and correct the behavior." Says McDaniel: "At the end of the day it's customer service. Some deputies don't like when I say this, but we protect and serve our customers. They don't need John Wayne chewing on a toothpick. They need someone better, more polished…if you're unprofessional, yelling at people…you're affecting everyone in this county. You may be the only contact this tourist has with Americans. They may have saved up for five years to go on this vacation with their five kids." Across the country in another Orange County, the Anaheim (Calif.) Police Department patrols another theme park corridor, including the granddaddy of them all, Disneyland. "We don't see an increase in crime as a result of having resort areas," says Lt. Bob Dunn, Anaheim PD's public information officer. He explains the department's strategy to prevent crimes against both locals and tourists is to build networks and promote communication with all elements of the community. "The more we visit and engage with people and let them know what would make them a victim, the more we see it does prevent [crime]," Dunn says. The Anaheim PD produces a PSA of safety tips and has worked with hotels to place it on the guest TV channel. The department is active on social media, too. And it trains "Resort Ambassadors," volunteer foot patrols that provide directions and act as an information source. Anaheim PD has found partnerships to be a crucial part of its public safety strategy. These partnerships include working with Disney security, other theme park personnel, hotel staff, and other key players. The agency also keeps up with best practices at tourism policing conferences, and has helped businesses set up a Crime Alert Network. The network lets participants share information about various criminal activities; for example, someone stealing credit cards. And like its counterpart in Orange County, Fla., the Anaheim PD boasts a robust crime analysis unit that spots trends such as analyzing repeat 911 call locations. "Every week we have a crime meeting where we study calls for service," Dunn says. "We have conversations about the best approaches to this information, how to get it solved, how to prevent it." Gatlinburg, Tenn., Police Chief Randy Brackins agrees policing tourist areas requires a bit more finesse than policing other locations. "It's definitely different from normal policing," he says. "We have to be very hospitable." Gatlinburg's population is 4,100, but overnight in peak season it swells to anywhere from 45,000 to 65,000. The Fourth of July parade, which starts the night of July 3, draws 60,000 to 80,000 folks to the town's sidewalks. Like Orange County SO's McDaniel, Brackins says tourists can find themselves victims by not being cautious. "Maybe they've had an extra drink or two, and they're walking around town more relaxed, not on guard as much. They get caught up in visiting shops and don't pay as much attention," he explains. While Gatlinburg has some theft from visitors leaving behind cell phones or cameras, Brackins say his main problem is bottlenecked traffic through town, as route 441 leads into Great Smoky Mountains National Park. Gatlinburg uses walking patrols and bicycle patrols on the "packed" sidewalks. "We have as many officers out there as we can see," Brackins says. In peak season, they overlap a 10-hour shift. "Our goal is to reduce crime and have a higher quality of visitor experience. If they're safe and feel good, they see officers around, they have a better vacation and feel at ease. It makes them want to come back. We want you (our visitors) to just be yourself and not worry about crime…we have to worry about crime." Brackins says partnerships are key to crime prevention in tourism areas. His officers regularly meet with the Gatlinburg Merchants Association and have established a notification system that lets them alert officers to specific concerns such as "counterfeit 20s or suspicious persons." Head north of Buffalo, N.Y., and across the Canadian border and you will see 6 million cubic feet of water gushing every minute. You'll also meet officers who understand what it takes to police a tourist area. Policing in the Niagara region can be different because it is transient for victims—and for criminals. The bad guys come to the area, which is target rich—and move on. Their primary source of criminal income while in the Niagara region is vehicle burglary and vehicle theft. "Tourists are more likely to have valuables on them or in their vehicles, more money, more belongings….and there's so many vehicles available [in parking lots]. So the thieves can find high-end vehicles they're interested in stealing," Ash says. Besides lost or stolen property, including passports, the casino district has alcohol-related calls, bar fights, and hotel evictions, particularly when hotels rent at a lower rate in the off season. The police also track crime data through an analyst and learn if certain parking lots of a hotel are hit at certain hours. "We're out there with proactive things; we stay ahead of it with a higher visibility plan to be in those parking lots and do covert things, too," Ash says. "We'll put an undercover in, and someone may end up stealing from the wrong vehicle." "The bad guys are looking through binoculars at lost tourists, and they see easy pickings," says Dr. Ken Peak, a professor of criminal justice at the University of Nevada Reno, co-author of the 2004 Department of Justice guide "Crimes Against Tourists" and author of 30 law enforcement books. "So there are obvious venues, special events, sites that are magnets for people. It's like the 'Vacation' movies with Chevy Chase. People get in a rental car, there's poor signage, and before you know it they're lost and can be a target." Peak, a former police officer, believes the answer to crime in tourism area is technology such as Compstat and predictive policing, not dummy cameras or empty police cars. He says crime can be subtle, not on the radar screen. You're not aware until you get a cluster. "We have to be able to identify crimes against the tourists and act against them. Because individual police retire, forget, but computers remember." All departments contacted for this article told POLICE they analyze data but don't keep tourism crime statistics. So maybe the best approach to policing in a tourist area was voiced by Orange County SO's McDaniel. "Get out of your car. Go meet people. You know the old adage 'It takes a village to raise a child'?" he asks. "Well it takes a village to police it. You can't rely on a cop in a car anymore. We must share information and come together. It works this way. Everyone pitches in, they help us, we help them." Kristine Meldrum Denholm is an award-winning freelance journalist based in Washington, D.C., and a frequent contributor to POLICE. She wrote for ATF's press office for 10 years.